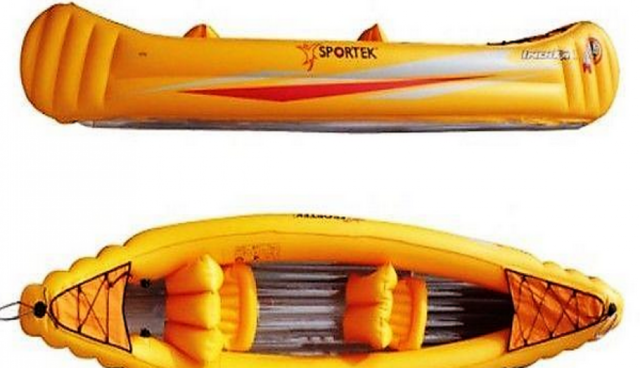 » Brand new Sportek Indika inflatable canoe with 2 paddles for only $199! Save $160! Brand new Sportek Indika inflatable canoe with 2 paddles for only $199! Save $160! Brand new Sportek Indika inflatable canoe with 2 canoe paddles for only $199! Save $160. This canoe with 2 paddles retails for $359 so you are SAVING $160 but numbers are limited!!! A very popular tandem inflatable canoe, ideal for use on rivers, lakes or any enclosed waterways. The seating can be arranged to allow both solo and double paddling and can obvioulsy be de-flated and rolled up to fit into the boot of a small car or a stoarge locker on the boat or caravan! For more info or come in and inspect today. Delivery available Australia wide… Call now!